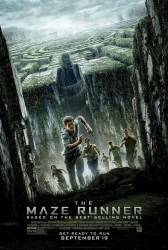 Reviewing my notes on the "Maze Runner" series after seeing the third and last film. THE MAZE RUNNER (Wes Ball 2014). Another YA action series, a leaner one whose action holds you throughout. It follows a makeshift society of teenage boys trapped in a "glade" surrounded by a giant shifting maze manned by critters called Grievers. 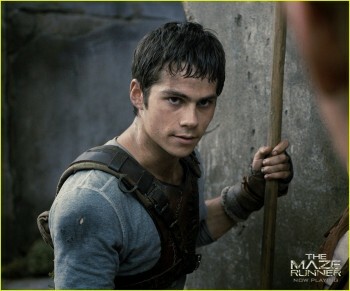 In Thomas as played by the intense, chiseled Dylan O'Brian, the movie has a a real leader figure, bold, brave, taking the initiative. The good supporting cast includes the Brits Thomas Brodie-Sangster (Newt) and Will Poulter (Gally). CGI is essential, yet not overused. The lone females are Kaya Scodelario (also a Brit) as Glade latecomer Teresa, and ex macchina lab baddie Patricia Clarkson. A fun way to unwind after a week of festival films. Metacritic 56. Watched at Regal Union Square 20 September 2014. MAZE RUNNER: THE SCORCH TRALS (Wes Ball 2015). The second episode of this YA franchise is more violent and scary but makes less sense than the first, saved only by the appealing cast and some new actors, including Lili Taylor, Aiden Gillen of Queer As Folk, Rosa Salazar, and Giancarlo Esposito. There's lots of action, not much narrative you can get a clear grip on. 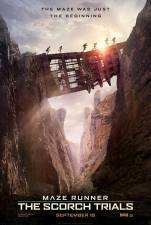 The Gladers, escaped from the Maze, are rounded up and confined for some kind of experiment because they're "Immunes," but they escape, to run across urban and desert landscapes (sets and locations are the thing here, some cool ruins plus some cool ghouls), only to have Patricia Clarkson turn up again looking dour and dressed in white. Stay tuned for what Thomas (Dylan O'Brien) will lead them to next. He doesn't know yet. At Regal Union Square 19 Sept. 2015. MAZE RUNNER: THE DEATH CURE (Wes Ball 2018). In what is said to be the final film of the "Maze Runner" franchise, though the YA books go on for three more, "The Flare," a deadly virus, is wiping out the planet and only one city remains, where the experiments go on seeking a cure from the immune Gladers. 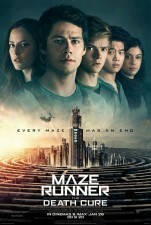 Thomas and a band of main Gladers invade the high security medical complex to free their own, especially Minho (Ki Hong Lee) - and maybe Teresa (Kaya Scodelario), who has joined the lab; and must escape to a Safe Haven, but with heavy losses. Wes Ball is some kind of genius, and wholly committed (watch the making-of video) at collaborative staging of action sequences with his young actors. Dylan O'Brien suffered serious head injury in an early sequence of jumping from a car to a train that seems to want to rip off both Mad Max and Fast and Furious but looks really risky and dangerous. The production had to be halted for a lengthy period while O'Brien recovered from severe trauma. Again Ball lets the action sequences, shot and edited so well, run too long every time, and I dozed off in the middle, only to wake up and be riveted and touched during the fiery, spectacular finale. The ending, with its tragedies and cliffhanger suspense, is totally involving, and the cinematography/CGI of the collapsing Last City wreathed in fire (shot in Cape Town, South Africa) is gorgeous. But the last frame is a closeup of Dylan O'Brien's face and indeed, there is something undeniably hypnotic about his intense look, no doubt at all tempered by the trauma he has come through. Metacritic 52%. Watched at AMC Bay Street, Emeryville, CA 26 Jan. 2018.